Pre modernist painting seen through contemporary photography. Gardens of Abstraction presents three contemporary photographers who are grappling with the history of painting and the question of how to be an artist in this photographic age. All three are working in large formats, using digital printing technology, and referencing, to various degrees, narratives of old master painting. 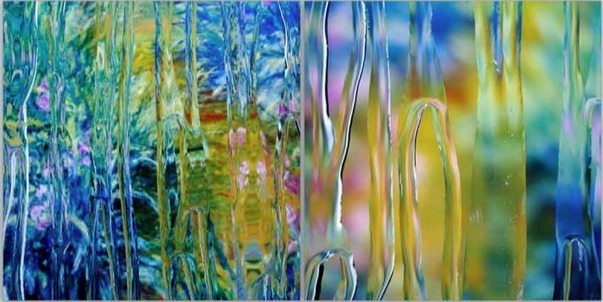 Carol Inez Charney has taken paintings by Leonardo Da Vinci, Monet, Van Gogh, Chagall, and Matisse, as her subject, appropriating them and then re-presenting them through her own personal lens of water moving on glass. Christy Lee Rogerscreates underwater scenes using multiple figures, elaborate costumes, and dramatic lighting that reference 17th and 18th century Mannerist and Baroque paintings. Diane Rosenblum, on the other hand, has turned to landscape paintings by the Hudson River School, digitizing them, sampling colors, and pulling them out into pixel-like blocks to emphasize the distance between these artists’ 19th century romantic vision of nature, and our contemporary tendency to filter experience (of both nature and culture), through photographic and digital media. I wrote about Charney’s work several months ago. In 2013, I first saw Carol Inez Charney’s striking semi-abstract photographs depicting details of modernist architecture partially obscured by and refracted by water. These large photographs, printed on aluminum, and unframed, were photographic, naturally, but also painterly, with the streams of water that seemingly flowed down an invisible, interposed glass pane both breaking up the image and reassembling it into painterly abstractions reminiscent of the works by Pollock, Still, Rauschenberg, Johns and others that had fascinated Charney as a student, launching her art career. In her latest body of work, After Painting, from 2016, Charney focuses completely on culture, i.e., universally beloved paintings by Leonardo, Van Eyck, Van Gogh, Monet, Matisse, Chagall and Picasso, all made before 1923, and now in the public domain. Using high-quality downloaded internet images, posters and reproductions from art books or posters, Charney rephotographs details from the works and groups them in twos and threes—into diptychs or triptychs, to employ the art-historical term used for multi-panel paintings. The ‘After’ designation refers to the art-historian’s way of labeling copies of old artworks made by admiring younger artists, a common practice before the advent of photography, and a way of paying homage to and learning from the past: Van Gogh copied Rubens, and Rubens copied Leonardo, and so on. Sometimes this hands-on method of assimilation resulted in creative variations, like Picasso’s innumerable Velasquez variations, or Manet’s quotations (or parodies) of Giorgione and Titian. Charney’s gradual shift of interest from the natural world to the world of visual culture is not unique in our postmodernist age, which looks at and to cultural production in the way that past artists looked at and to nature. If collage was the core of modernist art, appropriation, the quotation or sampling of previous art, could be said to be postmodernism’s. Sherrie Levine in her 1980s After Walker Evans photographs rephotographed the great social documentarian’s photos of the 1930s. Cindy Sherman’s faux movie stills, with the photographer costumed and made up to resemble archetypal movie heroines, but from movies never made, are another example of art deriving from other art.